Derby car kits and rules for our 2015 Pinewood Derby were handed out at the pack meeting yesterday. If you did not receive yours, please contact Paul Hinz as soon as possible. 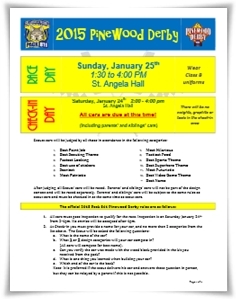 Our pinewood derby will be held on Sunday, January 25th, and looks to be another fun day for everyone. Remember that all adults and siblings are also encouraged to participate, and the entire family is welcomed to cheer on their favorite racer. This is one fun event for everyone. The wheels and axles must be obtained from the B.S.A. pinewood derby kit. All 4 wheels must roll on the ground, and there are specific rules on how the wheels can be sanded. Weight and dimension limits are strictly enforced. 5.0 oz is the absolute maximum weight. You will want to get as close to this as possible. A “stand” is purely optional, but if you create one, it must be within the specified dimensions if it is to be used. There are plenty of ideas for designs in our photo albums, as well as on-line. The best design, of course, is the one your Scout comes up with on his own. There are openings this year on the official derby pit crew. We need help with setup, decorating, race operations, food service, and check-in. All of these roles do not take much time, and are highly sought after for the prestige they bring to any professional resume. Please contact Warren Biederstadt to sign up.